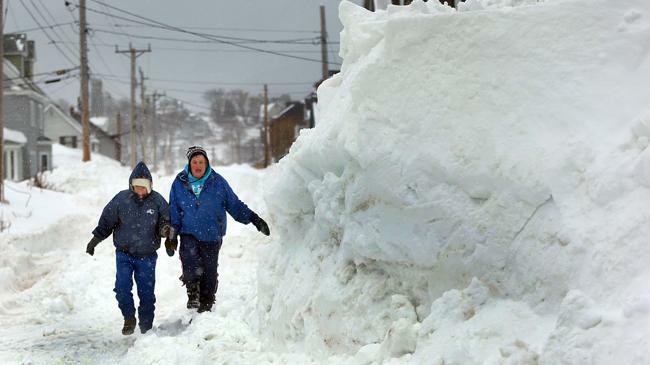 The top weather story this week is still all of the snow in my hometown of Boston. The totals are historic and many records have been broken. The regional transit system, the MBTA, has been crippled by the snow and the roads have not feared much better. The core of the problem is simple: there’s no place to put the snow. Storm after storm after storm has dumped feet of snow without warm periods in between to melt it away. Clearly the position of the jet stream is a major reason for the arrival of storm after storm to New England. But it doesn’t tell the whole story. An important reason for all of the snowfall is the abnormally warm sea surface temperatures off southern New England’s coast. A friend referred me to this article in the Washington Post. The article, penned by Chris Mooney, is titled What the Massive Snowfall in Boston Tells Us about Global Warming. The article talks about how the warm ocean temperatures, when mixed with cold air from Canada, quickly create a very powerful storm. It is similar to how Buffalo’s lake effect storms in November were so powerful because very cold air was traveling over very warm water. For a post I wrote on the process, go here. So how warm are these ocean waters? Almost unbelievably so. I left the rest of the quote in there because Michael gives a nice synopsis of the overall process. But 21 degrees Fahrenheit? Amazing! These storms have so much more energy at their disposal then they would normally. 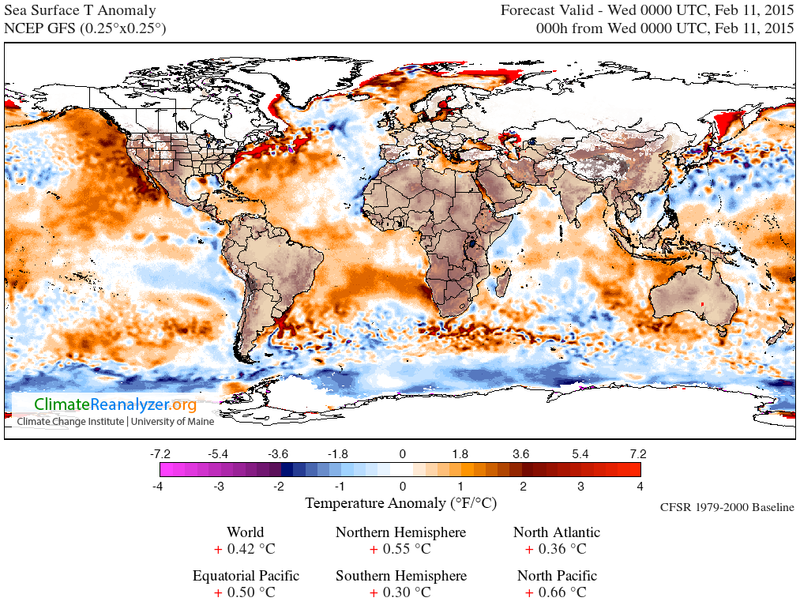 The following image, also from that article, shows sea surface temperature anomalies. This is the difference in the temperature from normal. You’ll notice that the water from the Gulf Stream is well above average. A lot of the planet is above average, but meteorologists have gotten used to seeing more red on these maps than blue. Sea surface temperature anomalies. Temperatures off of New England’s coast especially high. To show you the effect of warm ocean waters on a storm system, I pulled a couple images today from the European’s model (ECMWF) morning run. Unfortunately, yet another storm is forecasted for late this weekend and it could drop another foot or more on the Boston area (after a couple additional inches tomorrow). I can only imagine how the city will look if this comes to fruition. 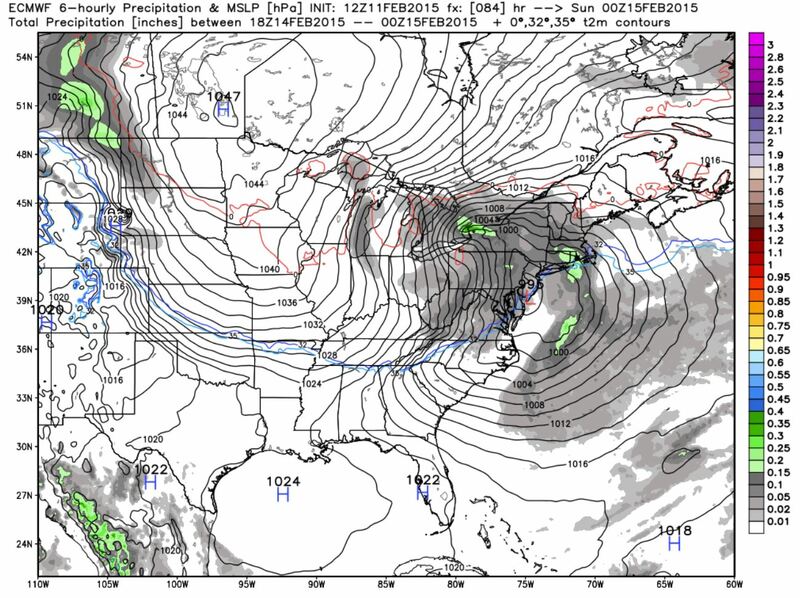 What I want you to see in the images is how the model forecasts the storm (the low pressure center) to quickly intensifies once it hits the warm ocean water. These images show surface pressure and precipitation and occur over only 12 hours. 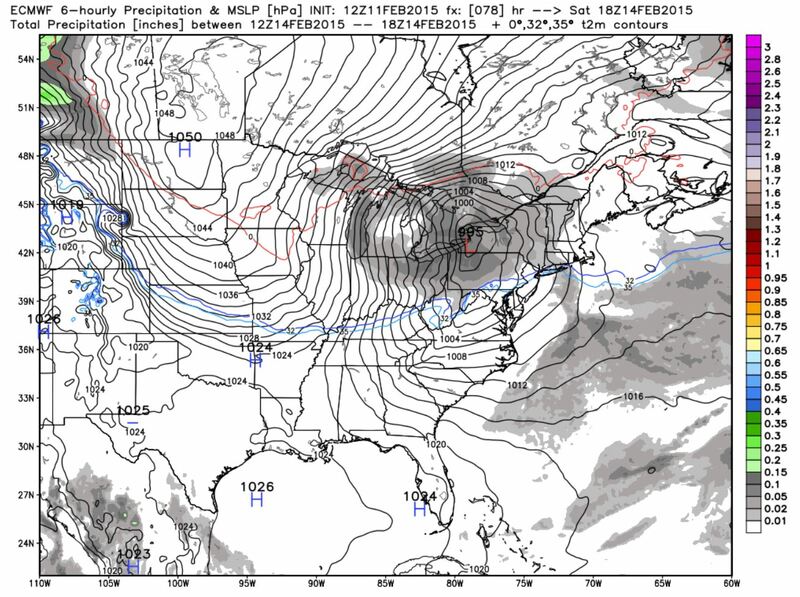 February 14th, 18z (1 pm): Storm centered near Buffalo, light precipitation throughout. February 15th, 00z (7pm on the 14th): Storm reaches coastline, bands of heavier precipitation appear. February 15th, 06Z (1am): The storm has quickly intensified with heavy precipitation over Eastern Massachusetts. The warm waters of the ocean have quickly strengthened the storm. The precipitation has intensified over a very large region and the barometric pressure of the storm’s center has dropped from 995 to 983 mb. 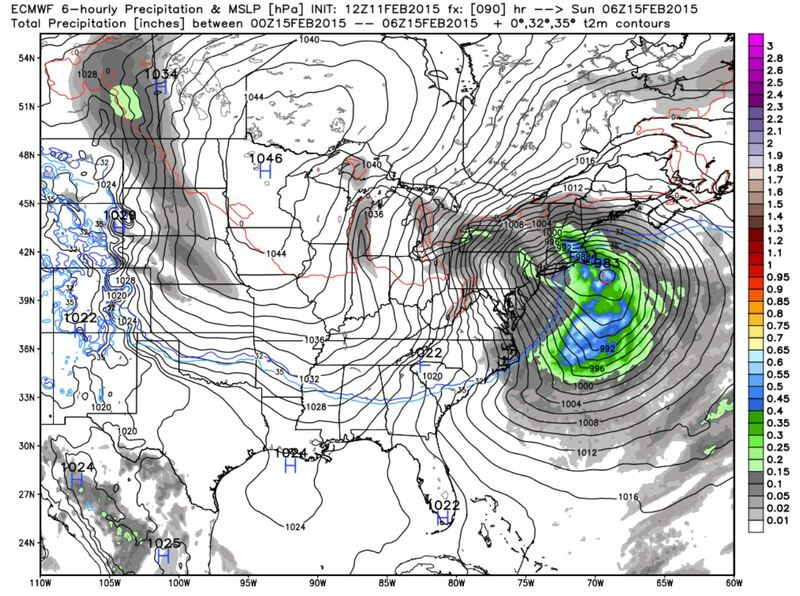 Now remember this is just what the European model is forecasting. But there is plenty of reason to believe the model since this process has already happened several times in the past month. For the sake of those in Boston, let’s hope its wrong. Chris Mooney’s article also brought up the climate change point, which I suppose is unavoidable. I try to avoid blaming any one instance, or even a season, on climate change. But whether or not you feel that Boston’s weather this month is a result of climate change, you may have to admit that a warming planet would make weather like this more likely. That’s not a comforting thought, and it reminds us why its appropriate to use the term climate change, not global warming. The planet’s weather is changing, but the exact nature of that change will differ with the region. With that I say goodnight everyone. All of my best to those struggling in Boston, please stay safe.